As soon as we hear about long, awaited weekend approaching, we keep ourselves busy – packing our essentials to spend those quality days either to our far-flung families or a trip around some most Googled destination, don’t we? With the vibe of long weekend around, many people start planning their vacay by booking travel or air tickets to reach just in time. The planning or booking of tickets starts taking place months before just to ensure any last minute rush. That is the thing with airlines, if you want to book a ticket, you need to book in advance, especially when holiday seasons are entailing in the calendar list. No matter if you have booked your air ticket in advance or just in the moment, flight cancellation is something that is uncontrollable. Failure on the part of airlines can cause such cancellation and you as a flyer has no other option other than to wait and get reimbursed with the cancelled flight compensation. Do you have any idea about flight cancellation compensation India? Do you know how to claim for cancelled flight? Despite your answer being yes or no, the following article will enrich you about what amount you legitimately need to ask for whenever the airlines convey the message “ oopsie your flight has been cancelled”. It is the duty of the airlines to inform the flyers at least 2 weeks before cancelling flights. If passengers are informed about such cancellation beforehand, airlines are required to provide either a refund or some alternative flight option. What amount should I claim for the flight cancellation compensation? If the cancellation is not brought in the notice to the passengers, then they can claim compensation for cancelled flight with the following amount along with the liable refund. 1. If the block time of aircraft is 1 hour – Rs. 5,000 or one-way basic fare + fuel charges (whichever is less) will be provided. 2. If the block time of aircraft is 2 hours – Rs. 7,500 or one-way basic fare + fuel charges (whichever is less) will be provided. 3. If the block time of aircraft is more than 2 hours – Rs. 10,000 or one-way basic fare + fuel charges (whichever is less) will be provided. Block time is the time duration in which the aircraft moves from its initial destination to the final destination. 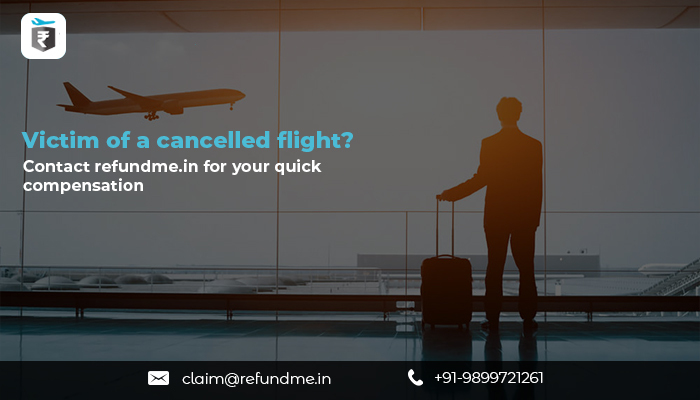 Now you know what you need to claim, contact refundme.in and get the guaranteed flight compensation for your cancelled flight in a quick turnaround.